A right-angled triangle ABC is right-angled at B. An equilateral triangle is constructed on BC. 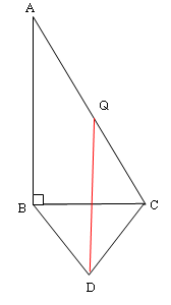 A line QD is drawn, where Q is the midpoint of AC. Prove that AB is parallel to QD. Making and proving conjectures. Similarity and congruence. Generalising. Angles - points, lines and parallel lines. Mathematical reasoning & proof. Inequalities. Creating and manipulating expressions and formulae. Quadratic equations. Networks/Graph Theory. Number theory.